Scattered Forest | Me. Pondering about life. Once in a while I see my ex-girlfriend’s posts in my newsfeed. She’s still clueless as ever, still chasing after the hot rich men. Even if she’s not with any now, you know she wants it. I call her clueless now after chatting to one of Jenny’s friend’s one day. His name is Zac, 28 years old and sophisticated as I would call it. Knows his restaurants and wine, and likes his women to appreciate the finer aspects of food and wine as well. We met one day while visiting Jenny at rehab. That was when she had broken her leg. Anyway, Zac had once dated a younger girl who he took out for lobster. She ate it and after that all she could think about was dessert. Bad impression for him. Somehow we got on the topic of girls that were clueless in life. Ones that cared only for materialism. Impressed by cars money. that kind of stuff, but not really aiming or interested in anything else. Simply put, clueless, and this I found, was a wonderful descriptor of Joyce. On her wall today I found this conversation with a boy that must be all hung over her and believing that he loves her. They call each other bro but you can tell, it hurts him just a little every time she calls him that. The effort he puts in to continue the conversation and to make it interesting is blindingly obvious – at least to me. Give it up fool! You think she’s your friend but she’s not. She only likes talking to you cos you pump up her ego. Is it really worth all that effort for really nothing? Looking at him I find him a bit of a sad soul. I pity him. Cos I was once in his position. Boy am I glad that relationship ended. I’m so thankful now that it ended as fast as it did. I suppose I should at least thank her for that. I am at least a little curious as what kind of person she’ll end up with in the end. Maybe I’ll find out again when the posts appear once in a while in my newsfeed as the years go on. I feel like this because I hung with my chill friends on Saturday night. Melina and Janean. Jenny came too 🙂 We had korean BBQ and then we watched Mel gamble after. Jenny left early though so she wasn’t there for the gambling. Mel won $50 as she always does at Casino Wars and bought us ice cream. Then we just hung by the riverside outside Crown and chilled chatting. It felt good just talking about stuff. Then we took the train home. I followed Mel cos she offered to drive me home. Saw her house for the first time, she had a large yard and concrete area which was so open. Then she drove me home. I was flipping through some of Michelle Phan’s old youtube videos and came across her Paper Bag Curls Tutorial. It was nice watching her old videos like this again. Seeing the roots where she came from. Having been a subscriber since near the time she first started making vids, this video held some nostalgia to it. I often watch her vids just for something familiar because it makes me feel comforted and safe. It’s like, while everything in the world becomes scary and changes there is one thing that doesn’t, and stays static. One place filled with happy memories that you can always return to even if the world outside becomes too rough. (I have also experienced this with reading long lasting friend’s blogs). I remember back in the past when I talked to one of my friends, May, about make up tips, and we found it funny that we both knew the business name card mascara trick. In the end though things do change, and so does Michelle Phan. The feelings of those times don’t quite transfer to her new videos, but I guess that could just be because they are new. And where did her cute little bunny go? I heard that it passed away ): I also wish she would keep making videos for her RiceBunny channel. She’s still a great guru though. And the truth dawns. Or rather that’s how I’d prefer to think of it – that that was the only reason why we didn’t work out back then. 1. Write again. And I mean write. I want to develop some of the old story ideas I came up with way back in high school. Stories that hold the feeling of living a life unknown, and wanting to find out what happens. With a tinge of romance – romance as in interactions between a boy and a girl, but no romance as in a love story. romantic in the sense of where the scenes take your thought, but nothing more. One story I wanted to develop for a long time was about a boy and a girl who live their separate lives with no knowledge of each others’ existence. They live in the same neighbourhood but have never met. Somehow though they influence each other indirectly, like the boy might have been at the swing in the park and somehow left something there and when the girl goes there she is somehow influenced by it. Maybe a scratch mark the boy did subconciously while fidgeting might influence the grl to think about the deep things in life… something along those lines… it would be great. Another story I want to write about and redevelop is the story I wrote for a year 12 imaginative writing piece where the backbone of the story is about a girl as she walks home with food to cook for her brother, but intertwined between this core base, you learn about events that surround that point in her life, perhaps some of her thoughts, things like that. The story was called Monika after the name of the girl, the brother’s name was Stan. 2. Develop an online facebook game. It would just be fun to do so. I’m thinking something along the lines of an rpg, run and customizable, something with gameplay like “Chronicles of Blood” on facebook, and with customizability and the ability to gain badges as in pokemon that will give you special passive bonuses in battle (like +3% attack). Not very unique, but it would be so fun to build and a project that I can have fun chipping away with. 3. Perhaps not so much a todo but RO has good memories for me. 5. Take a hair dressing course, OR at least learn how to do hair properly from youtube videos or something. Would be fun. 6. Find some good songs again. and get back the old ones I loved! Find stuff on Tommy Heavenly (former The Brilliant Green lead singer). Get back some of the old Jay Chou classics and old favs. “7 yue 7 ri qin”, “jing tian ni yao jia gei wo”, “wu ding” (maybe). Get back those songs! 7. Get back into some good jap drama. Can’t wait to find some!!! 8. Learn some good songs for the acoustic guitar and finally learn to play the electric guitar properly! 10. Play around with makeup, because I’m interested. 11. homg sleepover at my place with Mel and Janean it’s going to be so fun i love it! YAY! 12. Do something nice for my friends. Like get them something. Cos it’s about darn time i did! Now I want to do some drunken exercise. Leg ups would be nice. Today I found an interesting facebook app. 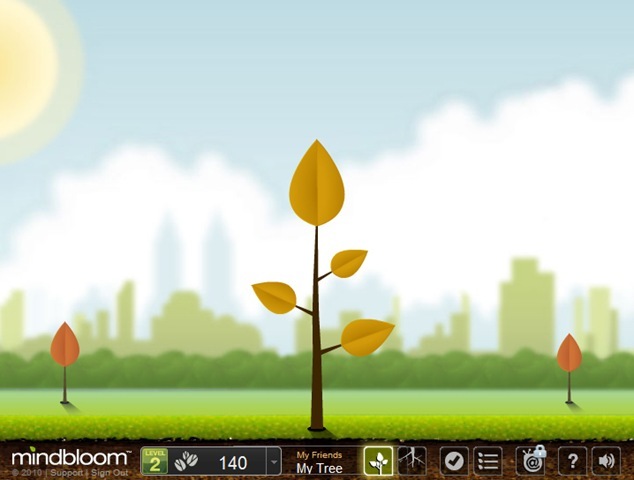 It’s called mindbloom and it is a “game” that promotes a balanced life style. Users are given a sapling that starts with 3 branches. These branches are based off the areas in your life that you would like to work on. The app has you do tasks to grow your tree. I like this app because its simple charming graphics, and the way in which it helps improve users lives. The tasks, although simple, get you away from your usual daily routine, and gets you in to really thinking about your lifestyle, health, relationships, career, wealth, or whatever other category that you chose to work on. For me, I have chosen to “Take some time off everyday to unplug and relax”, “Create a list of things I want to try in my life” and “Make time to let my closest friends know how much I appreciate them”. In my opinion mindbloom is an innovative way to get users to try new things, things that are not necessarily incredibly profound, but are the little simple things that fill up a life and make it special and meaningful. Ahh Melina. You are awesome and make my day. I stumbled across this list of 41 things guys wish girls knew on facebook and I find some of these entries particularly true. Sometimes you wish that girls just knew. 1. Guys are more emotional then you think, if they loved you at one point, it’ll take them a lot longer then you think to let you go, and it hurts every second that they try. 3. Guys go crazy over a girl’s smile. 5. Guys hate it when you talk about your ex-boyfriend or ex love-interest. Unless they’re going for the let-her-complain-to-you-and-then-have-he… method. 7. Boyfriends need to be reassured often that they’re still loved.